NBC Boston reports the 64-year-old Easton man was hit about 1 p.m. Wednesday on Washington Street, which is Route 138. The victim parked his van on the street, along the breakdown lane on the northbound lane, when the passenger truck plow approached. The victim was fixing the rear tire on the driver’s side when he was hit. According to the Brockton Enterprise, police arrived to find broken vehicle parts, a pair of sneakers and other debris littering the street. The car jack, tire and van were left behind. Neighbors witnessed the horrific crash and told NBC Boston that the victim had been kneeling down when he was hit by the plow’s blade, then dragged. One homeowner has turned over home surveillance video to help police with the investigation, according to the news station. Police are still investigating whether the plow driver will face criminal charges. The police chief told NBC Boston that one focus of the investigation will be where the victim was at the time of the crash, whether he was in the roadway or off the roadway. Police have not released the driver’s name, but said he remained on the scene and cooperated with the investigation. In the Chicago suburbs, there was another sad story in the Village of Libertyville. A 75-year-old man was killed Monday morning while clearing snow and ice from his driveway. According to news reports, the victim may have been snow blowing his driveway when a snow plow driver backed into him. The crash happened in a cul de sac in the 600 block of Bridle Court in the Village of Libertyville. The man was pronounced dead on the scene and the plow driver was placed on paid administrative leave pending an investigation by the Lake County Major Crash Assistance Team began investigation. Snow plow truck accidents happen every year in Massachusetts and they are often fatal. Snow plow drivers in Massachusetts have a responsibility to obey all traffic laws and exercise caution, always watching for pedestrians and other vehicles. They must meet certain requirements to clear snow. First, snow plow drivers must apply for a commercial driver’s license (CDL). Second, they must buy commercial auto insurance, along with plow equipment. Finally, the Registry of Motor Vehicles issues special snow removal plates which they must use. Yet, beyond this, there is little oversight, including no restriction on how many hours they are allowed to work. Plow drivers can work for private companies and contract with cities, towns, the state or private businesses; they can be owned and operated by cities and towns or they can be owned and operated by the Massachusetts Department of Transportation. Over the years, Massachusetts has seen numerous snow plow accidents lead to serious injuries and death. Causes of snow plow accidents can include drowsy driving, checking a cell phone and inexperience with the heavy machinery. 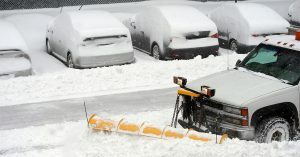 Snow plow drivers have faced criminal charges and civil lawsuits in Massachusetts. In 2016, a plow driver was charged with manslaughter in the death of a 60-year-old man he struck in Medford. The victim was an employee at the Whole Foods in Medford and was hit in the store’s parking lot. Police allege the plow driver had been smoking marijuana prior to the fatal crash. Another tragedy came in February 2015, when a 21-year-old Fitchburg woman was killed in a snow plow accident as she walked home from a local Market Basket, where she worked. Her family filed a wrongful death lawsuit against the snow plow driver and his company, Einstein’s Inc., along with his insurance carrier, Plymouth Rock Assurance Corp. According to the Sentinel & Enterprise of Fitchburg, the lawsuit alleged the driver had operated negligently, recklessly and carelessly and created a safety risk on public roads and highways and that the company had breached its duty to public to ensure the driver was operating safely. If you or a loved one have been injured by the negligence of a snow plow driver in Massachusetts, our Boston personal injury lawyers can help you learn your rights for seeking compensation. For a Free Legal Consultation, Call Breakstone, White & Gluck of Boston at 800-379-1244 or 617-723-7676.